This unique combo features our 100% Pure PredatorPee® Coyote Urine in the 64 oz Refill Jug together with a 16 oz spray bottle and 6 packages of PredatorPee® Scent Tags. The 64 oz growler now also comes with its own adjustable sprayer. Use all of this to set up a "pee-rimeter" around the area you are trying to protect. This combo will treat approximately 600 linear feet and offers big savings over single unit prices! Protect gardens, shrubbery and pet chickens with this all natural deterrent. PredatorPee® Coyote Pee Brand Coyote Urine works by allowing you to use a pest animal’s natural predator/prey survival instinct to stop the pest from causing damage to your yard, garden, home, barn, shed, garage, crops, plants, trees and shrubs as well as cars, trucks, campers, RV’s and other vehicles and power equipment. 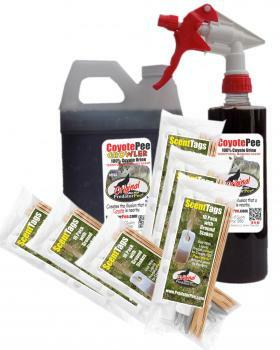 Our PredatorPee® Coyote Pee Brand Coyote Urine provides the scent of the predator to repel pests that are the coyote’s primary prey. This natural raccoon and deer repellent spray also works on groundhogs, iguanas, woodchucks, opossum, gophers, rats, roof rats, Norway rats, and marmots. When these critters catch the scent of a predator coyote nearby, they want to leave fast! So, if you have these pests, PredatorPee® Coyote Pee brand Coyote Urine is the solution. PredatorPee® - bringing Pee to the People for over 30 years!